Find Quinoa And Activated Charcoal For That Mid Year Health Plan In Jayanagar! Now Jayanagar 5th block has a new addition to its health brigade, with Grower’s Lane. It even has an attached cafe that dishes up some South Indian classics with a healthy twist. Switching to a healthier lifestyle is getting easier with the range of options we have for cafes, restaurants and, grocery stores all over town. With a mission to re-establish the connection we had with our planet, the aim is to promote a healthy and sustainable lifestyle while catering to our fast-paced and rather unhealthy one. Grower’s Lane stocks the much needed organic, locally (and ethically) sourced grains, condiments, snacks and, kitchen staples, and some fresh produce. They also stock a limited number of cleaning agents, home ware and, health and wellness products like kitchen appliances and cooking ware, aromatherapy candles, and food grade activated charcoal powder from in-house brands all at reasonable prices. With an entire section dedicated to grains and pulses we’re impressed by the variety they have that aren’t wheat or rice! They’re well stocked with all locally available types of millets be it foxtail, pearl or ragi. The store’s staff will be more than happy to help you out should you be confused with the number of options available. Quinoa lovers! They stock black and white varieties (and flour) as well. 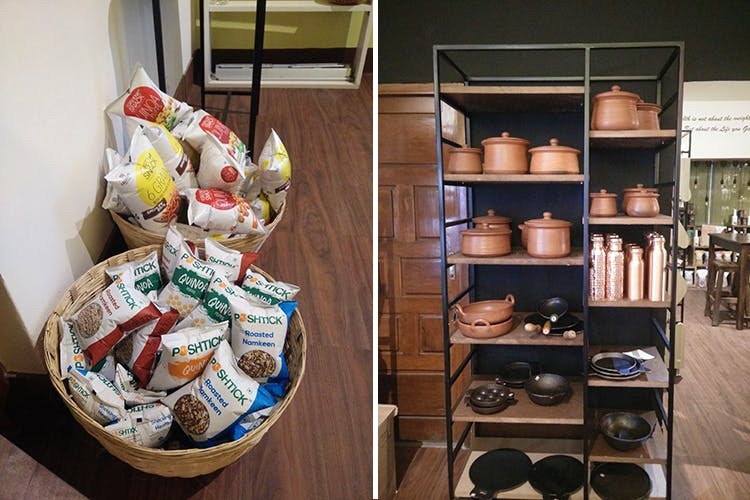 For those of you still not brave enough to make a sudden switch like us, you can take it slow by just replacing your snacks with healthy options like ragi-based cereal, seed and nut-based munchies. If you’ve been looking for superfoods like goji berries, chia seeds, and other healthy additions to your smoothies and salads, the store also has a dedicated section for superfoods and low calorie snacks. Speaking of snacks, they have a small farm to fork cafe - Ishta Cafe focusing on locally-sourced produce. The menu is largely South Indian, with few unconventional options, you’ll find the standard South Indian breakfast fare like idlis, dosas and vadas, all made from millet. For something heavier, they have millet-based rice option, meal plates, and evening snacks. We would recommend their experimental options such as the millet or whole wheat Humble Pie (pizzas), Quesadilla or, one of their healthy wraps for some guilt free indulgence.